Steve Blamires comes from the heart of Robert Burns country, the port town of Ayr on the Firth of Clyde in the south-west of Scotland, where Celtic culture and the Gaelic language still thrives. On a very clear day in his youth he would have been able to look across the Firth and see a faint outline of the Northern part of Ireland, a place with which he was also to have deep associations in years to come. As well as living among its people and their traditions, Blamires has become a leading authority on Celtic folklore and has even represented the Celtic peoples at the Council for a Parliament of the World’s Religions. The ways in which he has served the Celtic way of life are both numerous and profound. He founded the Celtic Research and Folklore Society in Scotland as well as editing its Seanchas journal. He was part of a team including Tibetan monks to establish Holy Isle as an all-inclusive spiritual retreat centre in the Firth of Clyde. He has also worked to commemorate the hundreds of Scottish people displaced by the Highland Clearances and helped to establish a memorial fund. Blamires’s work outside his Scottish homeland is equally impressive. He has lead many tours to sacred sites in Europe and served as both presenter and tour-guide on National Geographic expedition ships. After moving to the Hudson Valley area in New York State he continued to advance the cause of Celtic peoples and their culture, contributing many articles and teaching various workshops in related subjects. He has taught an overview course on Celtic Culture at Peninsula College in Washington as well as founding the “Wandering Angus” resource and educational centre. 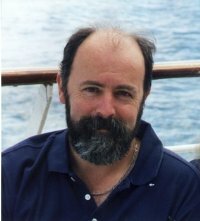 Widely travelled and eminently experienced with sacred sites he continues to provide valuable historical and anthropological analysis in various formats. Like Robert Graves before him Blamires likes to go directly to the source for his work, which is well illustrated by his first book (soon to be reissued by Skylight Press). The Irish Celtic Magical Tradition: Ancient Wisdom of the Battle of Moytura takes a close look at the ancient text to find links to resonant traditions and workable practices. Using a clear translation from the Irish Texts Society, Blamires offers an excellent exegesis in order to explore its relevancy in our day and age. His following work, Glamoury: Magic of the Celtic Green World continued to wrest mythology from the annals of dead folklore and make it come alive in a modern practical sense. As summarised by the Midwest Book Review – “Glamoury is a holistic magic system promoted to break down barriers between humans and the natural world. Based on the ancient Celtic spiritual tradition, this offers techniques which blend Celtic history and research with exercises designed to expand psychic abilities.” Blamires then went on to tackle the origins of Ogham in his next work, Celtic Tree mysteries: Practical Druid Magic & Divination, which has become a leading text on the subject. The book instructs the willing reader on how to navigate both the Ogham script and the Tree Alphabet but more importantly how to incorporate the wisdom found into their daily lives. In his most recent work, The Little Book of the Great Enchantment, Blamires examines the life of William Sharp (1855-1905) who wrote under the mysterious nom de plume of Fiona Macleod and was an editor for Walter Scott, Matthew Arnold, Algernon Charles Swinburne and others. Sharp also associated with the likes of W.B. Yeats, “AE”, MacGregor Mathers, Dante Gabriel Rossetti and was a member of the Hermetic Order of the Golden Dawn as well as Yeats’ secret Celtic Mystical Order. Blamires skilfully unravels secrets from the life of William Sharp and the writings of Fiona Macleod, especially in relation to Faery lore and magic. Skylight Press is proud to reissue an all new edition of The Irish Celtic Magical Tradition and to include Steve Blamires in our growing coterie of writers on the British mysteries. The press will also be publishing a follow up work on Sharp/Macleod entitled The Chronicles of the Sidhe later this year. This entry was posted in British Literature, Esoteric, Literary Criticism, Literature, New authors and tagged British Literature, British mysteries, celtic history, Celtic Literature, Celtic Mythology, Celtic traditions, Company of Avalon, Company of Hawkwood, Dion Fortune, esoteric, Faery Lore, Fairy tales, Fiona Macleod, folklore, Gaelic studies, Gareth Knight, Golden Dawn, Irish history, Irish mythology, mythology, national geographic expedition, Occult, Ogham, Sacred Sites, Scottish history, travel, Tree Alphabet, Tree lore, WB Yeats, Western Mysteries, Western Mystery Tradition, western mystery traditions, William Sharp. Bookmark the permalink.